After Presidential Elections, What Next for Timor-Leste? The new People’s Liberation Party, with its promise of a fresh approach, could make waves in Timor-Leste in the future. 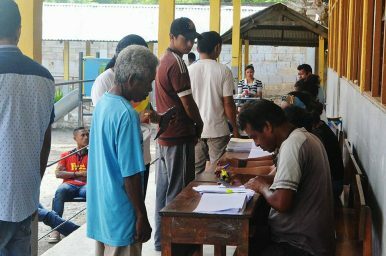 The March 20 presidential election was the first election held in Timor-Leste without assistance from the international community since the United Nations (UN) Mission departed in 2012. It was considered a success, with elections held in an orderly and peaceful manner with no major incidents reported. March 20 was also the first time since the country’s independence referendum that Timorese in Sydney and Darwin, Australia and Lisbon, Portugal could vote without travelling back to Dili. This time around, it is interesting to see how each candidate diversified their campaign techniques to convince new voters and on-the-fence voters, as well as to retain old voters. Civil society organizations and media at the same time also played an increasing role in providing information about each candidate to the public through televised talk shows, interviews, and live debates. This 2017 presidential election was an important test of Timor-Leste’s stability in many ways. According to the latest figures released by the Technical Secretariat for Electoral Administration (STAE), Dr. Francisco Guterres, famously known as Lu-Olo, secured 57 percent of the votes while his closest rival, Antonio da Conceicao, or Kalohan, secured 32 percent of the votes. Those counts are still pending final confirmation, scheduled on April 2. This election will strengthen the debate about a generational gap in Timor Leste. As generational dynamics are a significant element of Timor-Leste’s contemporary discourse, the relationship between the “Generation of ’99” or Jerasaun Foun and the “Generation of ’75” or Jerasaun Tuan is crucial for the social cohesion of the country. Due to the long struggle for independence, the Jerasaun Foun (referring to the leaders who emerged in the 1980s and ’90s in all fronts of the fight for independence from Indonesia) find themselves not having consensus in certain matters with the Portuguese-speaking Jerasaun Tuan, who now mostly dominate the government. The victory of Lu-Olo, a candidate strongly backed by former resistance leader Xanana Gusmao, further strengthened and confirmed the status quo of the country’s leadership, which is still largely held by high-profile resistance leaders. Two formerly opposing parties, the Revolutionary Front for an Independent East Timor (Fretilin) and the National Congress for Timorese Reconstruction (CNRT), demonstrated that their new coalition continues to have strong support across the country. CNRT and Fretilin were fierce rivals in the 2007 and 2012 elections. However this rivalry turned into an amicable political marriage when then-Prime Minister Xanana Gusmao of the CNRT reshuffled his cabinet and appointed a fresh figure from the Fretilin, Dr. Rui Araujo, as his successor. The Democratic Party (PD), who had until then formed a coalition with the CNRT, was miserably left out, becoming the lone (and weak) opposition in the parliament. While the Xanana-led CNRT party pronounced their support for Lu-Olo from Fretilin, other smaller parties such as PD, Partidu Kmanek Haburas Unidade Nasional Timor Oan (KHUNTO), and the nascent People’s Liberation Party (PLP) pledged their support to Kalohan. Moving forward, it will be interesting to observe the potential of the PLP, which is formally established on December 9, 2015. The current President Taur Matan Ruak has publicly announced his affiliation with PLP and has displayed his take on some social and economic issues concerning the country. PLP was established with a vision to “develop a democratic, just, and self-sufficient society.” Its appeal lies in its people-centered policy. Targeting mainly young people and new voters, with firm support bases among veterans, academics, and activists, as well as the trade unions and farmers’ organizations, the PLP’s policy targets are more inward-looking. It puts people at the center of all policies and programs. Sustainable rural-based economy is one key priority area that for the PLP. The new party emphasizes integrated development plans in important sectors such as a productive economy, social issues, infrastructure, consolidation of state sovereignty, and institutional reforms. The PLP’s strategies include development of rural infrastructure, job creation, domestic productivity, primary healthcare, and accessibility to basic needs. Democracy is highly valued in Timor-Leste. It proudly scored the highest ranking in Southeast Asia on the Economist Intelligence Unit’s recent Democracy Index. But that spirit risks running low after 15 years of independence due to the domestic challenges that impact Timorese people’s daily lives. The central concern in the country is now its high dependency on oil and gas revenues, with little distribution of power among its 1.2 million people. The current development process is centralized in Dili and many Timorese peoples are left out in the process. During the resistance movement for independence, the people were the subject of the fight; now they have become the objects of development. The PLP comes into play as an attempt to be a credible alternative political force that can clearly define national development processes that address important issues and challenges encountered by Timorese peoples. Having said that, the establishment of the PLP is envisioned to not only to compete in the political arena, but to also provide space and opportunity for all Timorese. The PLP is newly formed but it will be interesting to observe closely how far it could rise in Timorese politics in the near future, as it is a party that is issue-based and not highly dependent on figures. With such an approach, it could possibly be appealing to Timor-Leste’s youth population, which is now getting more access to social media and information. As a new party, the PLP will, however, take some time to accumulate votes and push its political agenda. It may not be a strong force to reckon in the upcoming parliamentary election but it could possibly be in the next election. For now, the alarming issues of growing corruption, imbalanced development, and widespread social and economic injustices in Timor-Leste remain largely untackled. At the end of the day, a democratic transition of leadership to a new party requires a shift in the attitude of the voters as well as a shift in Timor Leste’s development principles. Having said that, it is crucial for the long run to have educated voters in order to facilitate such a transition and also to minimize the current elite-centric approach. Jonas Guterres is an anti-corruption practitioner. He is former Advisor to Office of Commissioner at Anti-Corruption Commission of Timor Leste (CAC), and former recipient of United States Timor-Leste (USTL) scholarship funded by the State Department. Khoo Ying Hooi (PhD) is Senior Lecturer at the Department of International and Strategic Studies, Faculty of Arts and Social Sciences, University of Malaya. Timor-Leste's election comes at a critical time in the country's development.